AC Holtum-Born based CALLENISH CIRCLE was, in its original incarnation as GENOCIDE in 1992 by vocalist Patrick Savelkoul and guitarist Jos Evers, a straight Death Metal act. Numerous line-up changes afflicted the ranks until 1994 when, opting to switch titles to CALLENISH CIRCLE, the band issued the 1995 'Lovelorn' demo tape. 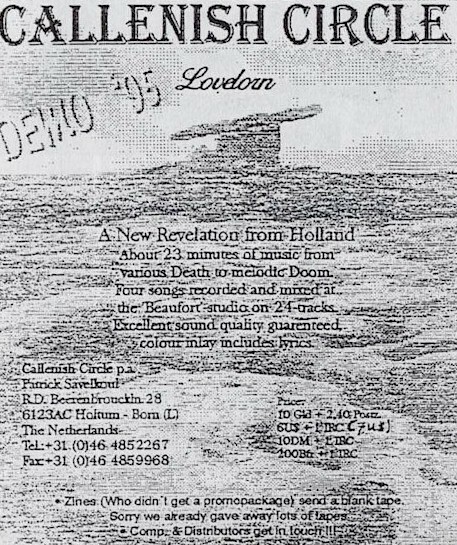 The tape made an enormous impression gaining the band the honour of "Demo of the month" in the well respected Dutch Rock magazine Aardschock and eventually winding up voted third best demo of the year. A string of contributions to various compilation releases ensued before CALLENISH CIRCLE landed a deal with Hammerheart Records. Pro printed covers and cassettes. Lyrics on back.